This entry was posted on September 27, 2012 by Lemony. It was filed under Clematis, Filaments and was tagged with Clematis, Filaments, Japanese Clematis, Nature Photography, Panasonic Lumix LX5, Pennsylvania, Spider Web, Web. M m m, this one has gone many light years away. Wonderful fluffy things float from the Clematis into the webs. 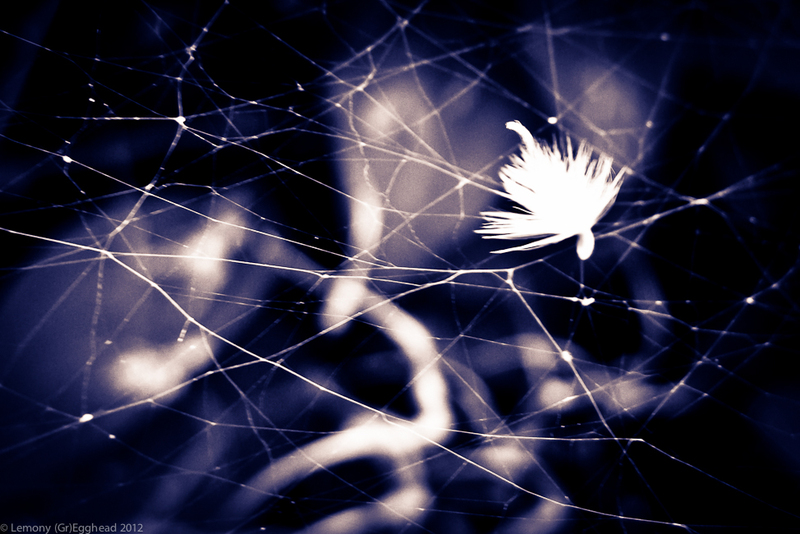 The webs themselves create such spectacular space and dimension. I just love it there! Beautiful work, Melanie…wonderful eye to see this potential in the photograph. Thank you, Scott. I’ll be spending lots of time there in the coming weeks. Oh, that’s a beauty, Melanie! So glad you like it, Richard! Very cool post processing and colors! I love that thought, Pablo… this comparison to a galaxy. Thank you!! Great photo! I love the cool tones and the dark shadows. Doesn’t look like anything from this world. The shapes in the background look like they could belong to an alien species. I love this comment, Denzil! Thank you!